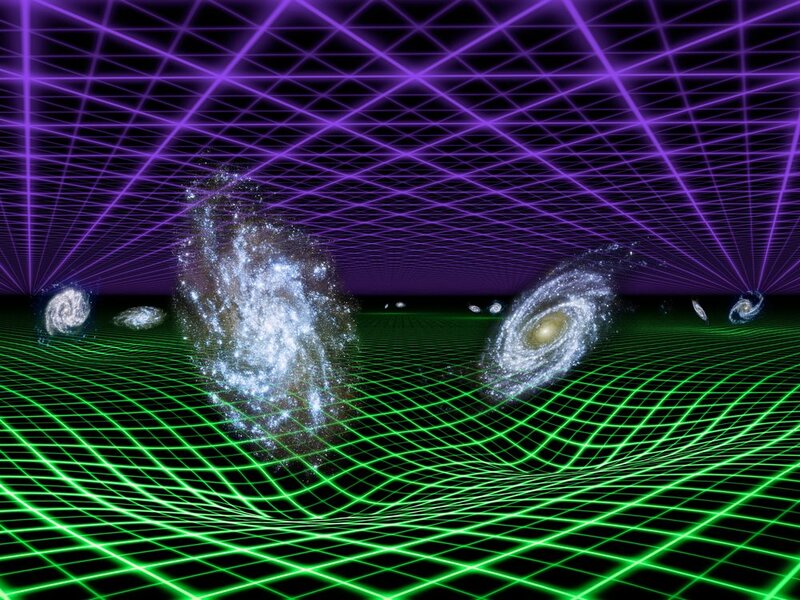 Is Dark Energy Pushing Our Galaxy Somewhere? Dark energy isn't pushing our Galaxy in a specific direction; it's responsible for the expansion of the space between all objects in space which are not tied to each other by gravity. So, for instance, dark energy doesn't influence the distance between the Sun and the Earth, because our gravitational ties are much stronger than the gentle stretching that space is doing. Similarly, our Sun isn't being moved relative to the center of our Galaxy, because the force of gravity binding us to the Galaxy is much stronger than what dark energy can exert. Dark energy can't even shear apart the gravitational ties which attach our Milky Way to the Andromeda Galaxy and the numerous, tiny dwarf galaxies which hover around our Galaxy in their own orbits. The distances here are enormous; Andromeda is 2.5 million light years away. Light arriving to us from Andromeda now will have left that galaxy when our planet Earth had only just seen its first humans. Dark energy is a force to reckon with only for galaxies much more distant from us, where the gravitational force between our Milky Way Galaxy and that faraway galaxy plays no role. It's often phrased as a gravitational counter-force, but that's only partially correct. It is true that dark energy seems to have a repellent influence on the space surrounding it, but unlike gravity, which is strongest around concentrations of mass in the Universe, dark energy seems to be evenly spread throughout the universe, with not a care for the presence of a galaxy, planet, or supercluster . It's this evenhandedness of dark energy that means that gravity can overpower it in densely populated regions of the Universe. Dark energy is not a directional force - there's no bulk motion to the left, right, or an arbitrarily defined up that this expansion leans towards. So there's no point to which the universe is being drawn, and equally there's no origin point from which the expansion is unspooling. Any given point in space is simply, and very gradually, becoming more distant from most other points in the universe. It's not that our Galaxy is being pushed around- dark energy is instead ballooning out the space within which our Galaxy sits. Where does dark energy come from? So far that's a mystery; we can measure its influence to a great degree of confidence, but if we knew the exact nature of why it behaves the way we observe it to, we'd probably rename it something less vague than 'dark energy'.